Colleen and Andy met one cold Saturday night in February, 2013 at maybe the least romantic bar in Chicago, Mad River. Colleen was there to meet up with her childhood friend-for-life, Jessica. Jessica came to the bar with her boyfriend Rob, and Rob brought along his roommate, Andy. Despite learning that Andy was a Cardinals fan, as the night ended Colleen asked for his number anyways. Their first date was at Club Lucky in Bucktown--after a night of non-stop conversation in a cozy booth, they both knew they had something special. April 9, 2017 was unusually warm for early spring in Chicago. Colleen and Andy woke up early and like many beautiful Sunday mornings, they decided to go for a run through the Lincoln Park Zoo. Since it was so early, all of the trainers were out with the animals. After watching the seals show off their skills, they made their way to the otter exhibit. Despite checking each and every visit, the otters were never, ever out. This morning was different. As Colleen watched a cute little otter amble towards the glass with a pinecone, Andy pulled the ring from a secret zipped pocket in his shirt. Shocked and overjoyed, she put the ring on her right hand, and they walked around the zoo the rest of the morning, floating on air. 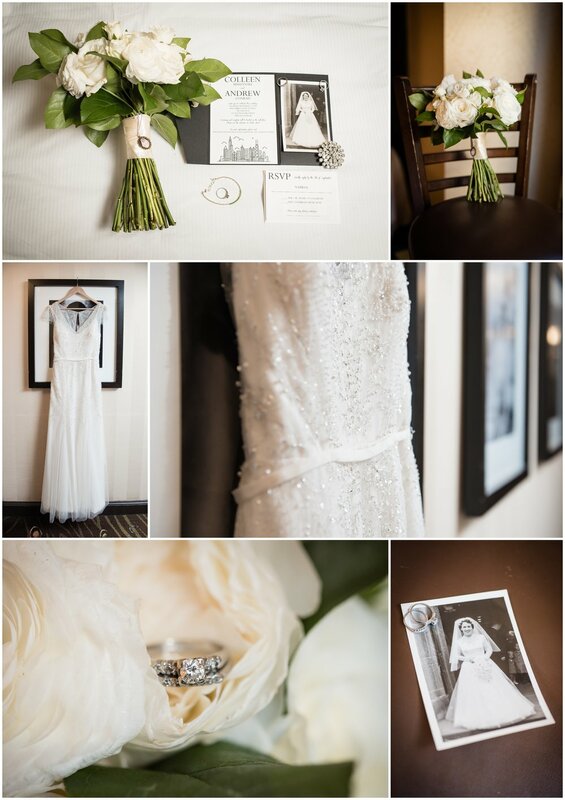 For their wedding day, they envisioned a easy, sophisticated party that showed off our favorite city. The National delivered big time. The beautiful, lush courtyard in the middle of the loop made for a perfect ceremony spot and easily transitioned for dancing under the city lights. The lounge provided the cozy sophistication. They had passed apps and food stations from their favorite restaurants at Revival Food Hall, which is on the ground floor of the building. The whole night was perfect!